As I settled into my race pace behind my newfound friends Derek and Gary, I also met up with some Spice Girls! Beth, Michelle and Jess had run the course backwards from UNCW and they helped pace me in those first miles. We tucked in right behind the men and chatted about weekend plans, food and fun. Beth & Jess peeled off near the UNCW track and I stayed in step with Derek and Gary. It was slightly windy and I drafted off of them in the headwind. At mile six, I stepped up my pace by five seconds - fueled in part by DJ Tom C and the Without Limits party truck and by protection from the wind on the west side of campus. At mile six, I picked up the pace again. 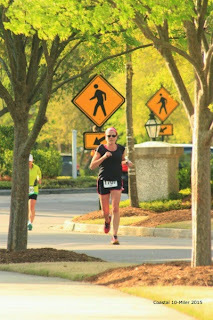 As we rounded a corner I noticed the girls that had passed me at the start of the race were now only 100 yards away. I kept my speed around an 8:25 pace and slowly reeled them in. I was excited to pass them around mile eight. Me? Competitive? Nooooooo. Gary teased me about changing the rules of the game and he backed off - not wanting to test a hamstring injury. Derek and I kept it up and at mile nine on the cross-city trail traded turns drafting and chatting it up. That last mile was tough: it included three small hills and a zig zag through the neighborhood to the finish line. My strategy was to take the tangents and pick up my effort through every turn. 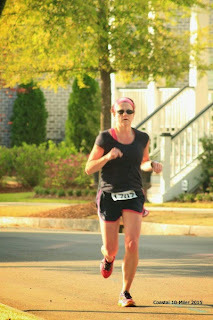 I finished in 1:26:52 and the aforementioned fist pump and self congratulating began. 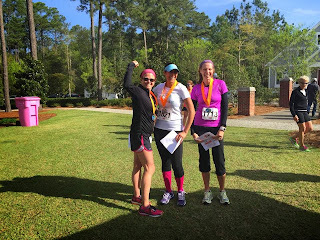 The finish line party was fantastic (Krispy Kreme coffee and doughnuts). We all got medals I received a thank you tile and a gift certificate to TrySports for first place in my age group. I made it on the podium and to my car in time for spin class.